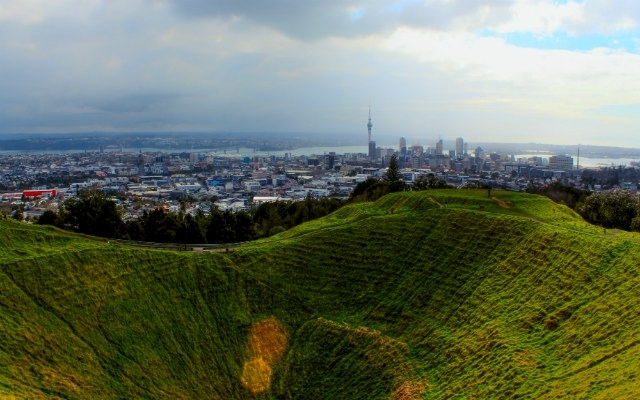 Something I still love to do, even as a long-term Auckland resident, is to take little jaunts up the volcanic cones that dot the city. I am not alone, as you will see that many Aucklanders use the volcanoes as places for exercise, picnics, or just to walk the dog. It must be some sort of human need to climb up to the top of things for a view, and in Auckland you have a lot of natural outlooks from which to do that. 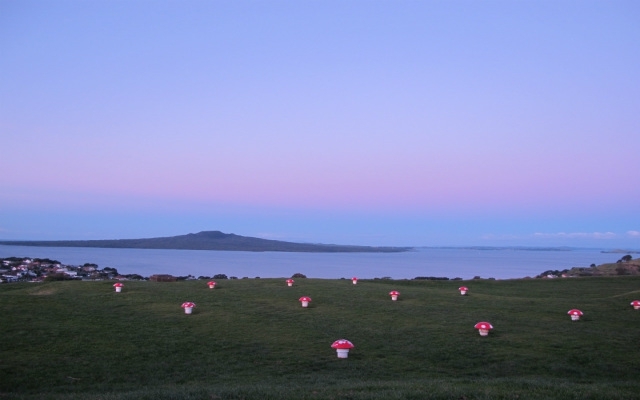 After the recent discovery in 2011 of four new volcanoes under Auckland, the total number tallies 55. Not that you’ll be running any “55 Peaks” marathon or anything as many are inaccessible, but know that you are never very far from an opportunity to explore some volcanic features. By far, the three most popular volcanoes are Mt. 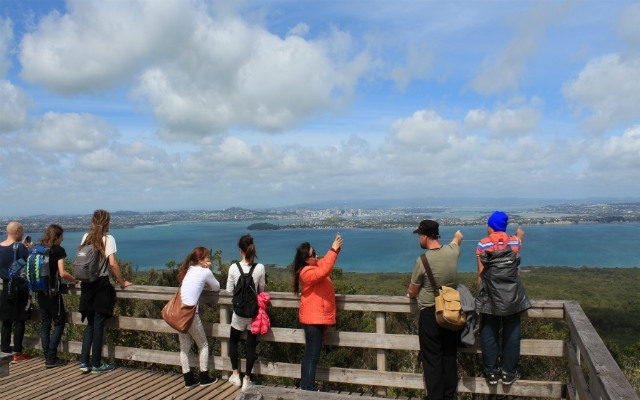 Eden, One Tree Hill, and Rangitoto. Let’s start with Mt. Eden/Maungawhau as it’s a perfect frame for winning shots of downtown Auckland. I sometimes recommend this volcano as one to go up even if the views are too cloudy from the Sky Tower. With our changeable weather, you can see rainfall roll in from the Waitakere Hills in the west, drench you, and then roll on out to the east. Somewhere in there you can go for a walk around the rim and take some photos of the city with the crater in the foreground. It’s nice to go when the sun is getting ready to set as the low light leaves beautiful shadows on the grass in the crater. You used to be able to walk down into the crater itself, but now people are asked not to do this as the site, which is sacred to Maori (as are all volcanic cones), was being damaged. You can still explore the undulating top and look out for the kumara pits, sort of like an early fridge. 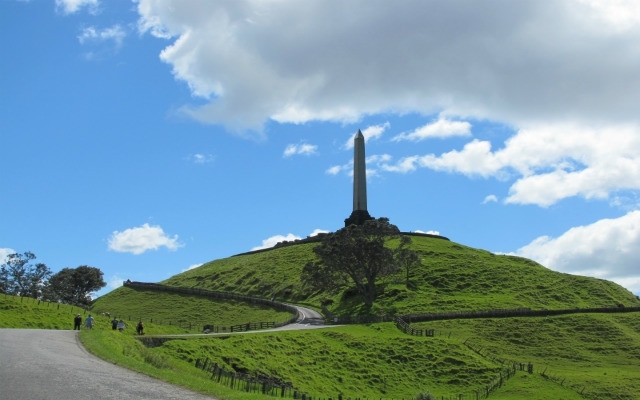 One Tree Hill/Maungakiekie sits within the expansive Cornwall Park. You will notice the distinct lack of a tree at the top of the hill but that was not always the case. There have been a couple of trees up there until a few years ago when the last one became too precarious and was removed. There is a long history of conflict over there with non-native trees planted on the historic site and Maori activists plotting, or attempting, to remove them. As it stands now, there are no current plans to put another tree up on the cone. There is, however, a large monument at the top with an obelisk which marks the landscape all the way from the airport. You can drive up, or park below and have a nice little climb. Once you are up there, try to spot the rock fields where people write messages, or get down and write your own. Back down at the bottom, you can find playing fields, a good park for children with a toy train to ride on, and a cafe making this a good destination for families. Both Mt. Eden and One Tree Hill are on the Coast to Coast Walkway. Getting to Rangitoto, our youngest volcano, takes a little more planning. For a start, you’ll need to book the boat and be ready with all the food, water, and sunscreen that you will need for a day as there is nothing on the island. You also need good shoes, as the terrain is rough volcanic rock, and a hat to guard against the harsh sunshine, even if it’s cloudy (seriously). So, once you are ready the fun can begin. Plan to spend 4+ hours on the trip and allow a bit more if you really want to do some exploring. When you land, check the return timetable and then head off up the hill. It’s great to have your lunch at the top overlooking the harbour as the views are quite something. If for no other reason, later you can say, “Yeah, it was that time I was sitting at the top of a volcano eating my cheese sandwich when...”. On the way back down you can try to find the lava caves. There are a few around Auckland but these are some of the most accessible so don’t miss the opportunity. Further to The Big Three, I’d recommend taking the ferry over to Devonport for a walk up Mt. Victoria/Takarunga. It has been used as defence and you can see remainders of the buildings and guns. Further on is North Head with its beautiful views across Tamaki Strait and out to the Gulf Islands. There are often people paragliding here. There are beaches worth noting as well. Takapuna beach, on the North Shore, has some really nice lava flows visible that you can walk on at low tide. They are right near the holiday park, which is easy to spot. Also, most of the West Coast beaches including Piha, Bethell’s, Karekare have some or all black volcanic sand. It’s quite striking. For more information about New Zealand’s volcanic activity, take a trip to The War Memorial Museum in The Domain. There is a fantastic exhibition about all things fire and molten lava and you can sit in a room that lets you experience what it would be like if you were home watching telly and a new volcano sprouted out in the harbour. Scary stuff! 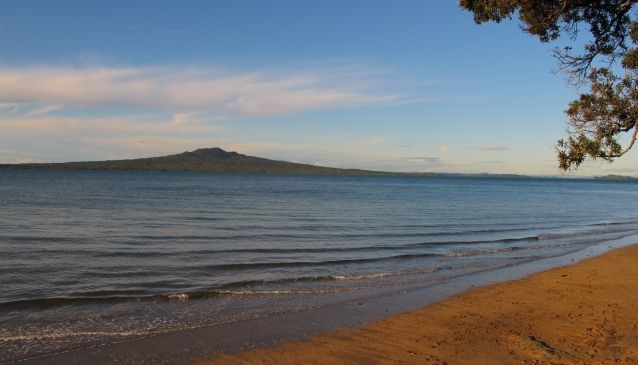 You can almost imagine what the early Maori were thinking when Rangitoto popped up. There is certainly plenty to keep amateur volcanologists happy in Auckland.